View of Kelley Walker, Galerie Catherine Bastide, Brussels, 2012. All images courtesy of Galerie Catherine Bastide, Brussels. There has been extensive discussion on the question whether Walker can be called an Appropriation artist. He denounces the label in interviews (and critics tend to agree) because the concept of Appropriation is based on the belief that there is an original source that can be appropriated. Rather, quoting Anne Pontégnie, who curated a show of Walker at Wiels in Brussels, the artist is concerned with “finding relevant ways of acting—as an artist—with the endlessly recycled images that constitute the only horizon of our reality” (2008). In the 21stcentury mess that our image culture has now effectively become, it is impossible to trace back images to an original source. If we were to enter Plato’s cave now, we’d find shadows of shadows of shadows (ad infinitum). This horizontal approach to images, semantics, layers of meaning, semiotic connotations, etcetera, puts Walker, in a roundabout way, in line with a younger generation of internet or post-internet artists who have grown up in the messy 21stcentury internet cave, and who, by definition, no longer have any use for originals and copies, copyrights or fixed states of artworks. 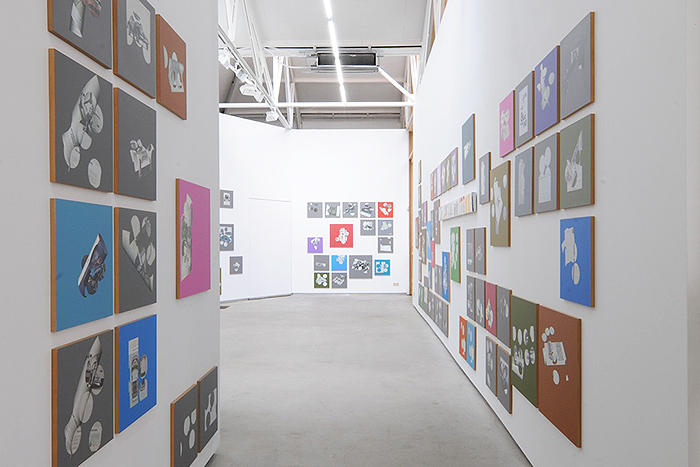 Walker is known, after all, for changing works between shows, for showing works in different ways every time and thinking of them as part of a continuum rather than a fixed product. He not only shares with these artists a horizontality to the meaning of the materials used but also the very materiality itself. Photoshop is equal to painting, laser cutting to sculpting. However confusing this might seem, this is the 21st century. It is, indeed, not easy being green.